Thanksgiving is a day for food, family, friends, and football. It’s also the perfect time of year to formulate your first (earnest) evaluation of what your favorite NBA team looks like in a particular season. As the Knicks get ready for a challenging back-to-back set with the Charlotte Hornets, the team finds itself sitting at .500 (with a 7-7 record). With seventeen percent of the season already in the books, with a complete roster makeover, with its new head coach, and its apparent lame duck team president, and with two new point guards — both returning from injuries on one-year, show-me deals — a .500 record is anything but underwhelming. After all, these are your beloved, dysfunctional, and tendentious New York Knickerbockers. Last year, the team stood on a precipice with a record of 8-6; In the 2012-2013 season, Carmelo Anthony’s best at MSG, the Knicks started the year red hot (10-4 in the standings); In between those two campaigns, however, the Knicks were 3-11 & 4-10 respectively at this point in the schedule. But, as November morphs into December, the narrative thus far is somewhere beyond the banality of numbers — and mere wins and loses — because there’s something different percolating beneath the bedrock of this franchise that’s almost incommunicable. It’s undeniable some nights, and often it confronts you in rim-rattling spurts; but the biggest story through fourteen games for the 2016-2017 Knicks is the emergence of a Latvian unicorn, who dunks like David Thompson and shoots the rock like Pistol Pete Maravich. And the name of this three-point shooting, shot-blocking, Neo Anderson is Kris-taps Por-zin-gis. Nearly three decades ago, we were supposed to be watching what we are seeing right now on a nightly basis: A young HOF talent, in the incubator, on the court with an aging HOF talent, on the backside of his prime years. At that time, in the ‘80s, it was Patrick Ewing and Bernard King. Unfortunately, to the woe of many New Yorkers, a devastating knee injury, followed by a foolishly rash decision (to jettison an adored icon), deprived Knicks fans from the joy of watching that prolific duo play together for a few memorable seasons. Sadly, Ewing never did share the court with a star worthy to be called his equal. The rosters of gritty overachievers he played alongside with just simply didn’t comprise a binary system. Not until perhaps injuries caught up to Ewing himself, when a couple of guards named Houston and Sprewell arrived. Carmelo’s two best seasons, when he advanced beyond the first round of the playoffs, came after an Olympic gold Summer, when he played with above average PGs, and had other vocal, alpha male voices in the locker room with him to help share the burdens of being the team leader. What I’m sensing is the mantra for this upcoming season, is the fruition of a dream — or perhaps a lament — that I’ve harbored for thirty years. We’re watching an aging HOF player in Carmelo Anthony playing with a (potentially) future HOF caliber player in Kristaps Porzingis. This in and by itself makes this season compelling. The unicorn may be too young and ‘Melo is probably a few years beyond being able to carry the load, but even if these two have crossed paths a few seasons too late it’s still worth the price of admission (at least for all those loyal fans who still wonder what 1991 might have looked like had Bernard been in NY with Patrick). It may be debatable if the Knicks have two legitimate stars on their roster this season, but it might also turn out that the whole is greater than the collection of its parts. To paint this picture, we can start at the PG position because clearly the play of Rose and Jennings is superior to what Calderon-Grant-Galloway offered as a compliment to Melo and KP last season. Jennings is embracing the city, and he’s helping develop KP; Rose is still a fantastic penetrating guard and his presence and production in the fourth quarter of games — clutch time — helps mitigate what appears to be the decline of Carmelo Anthony during those fourth quarter, clutch, moments down the stretch of games. Health plays a large factor in determining what Rose and Jennings can do for this team this year, but with more games played together will come greater confidence and chemistry, and the reasonable spectator isn’t foolish to posit that these two players will be integral if there is to be a successful run to the playoffs and towards that summer finish line. After the two stars (Melo & KP), and the two point guards (Rose & BJ), we look to our new coach, Jeff Hornacek, to find the third most influential factor impacting this season (and ultimately contributing to its success). Why? Well, clearly the coaching this year is an upgrade over what Derek Fisher represented both on and off the floor last season. Hornacek’s fluid substitution patterns has already paid dividends. His use of the Euro lineup (BJ, KP, Kuzminkskas, Willy Hernangomez) has really established something that we hope will only grow throughout the season. Going small with KP & Melo as the C/PF, and surrounding them with three guards, has worked. But, to me, the biggest thing I take from what the new coach brings to this team is seen in the development of the young players. Holiday has blossomed because of the confidence Hornacek has placed in him; the Euro kids crossed over the Atlantic and hit the court running. It’s still early, of course, but again while Hornacek may not be Coach of the Year or the next Red Holzman, he’s clearly an upgrade over what this team had on its bench twelve months ago. In summary, with KP proving he’s not a fluke, with Melo being healthy and reinvigorated and surrounded with the most talent he’s had since he arrived in NYC, and with two viable and professional point guards, this team is marketably improved over last year’s bunch. Then there are the role and bench players. The new kids provide excitement and energy, but there’s also some solid veterans to boost the depth. Courtney Lee has flashed what he might be and if he can ever deliver this on a nightly basis then this team would add another dimension to their offense, which will make it quite formidable come April and May. The backcourt of Rose and Lee is arguably the best tandem the Knicks have had in years. Noah may be more valuable off the court than on it (think what Rasheed Wallace brought in 2012). Noah is the quintessential personality that Anthony needs in the locker room to share the burden of giving the team an identity, and this allows Melo to flourish (think Kenyon Martin and Camby in DEN or Thomas & Wallace in ’12) because there’s less pressure on Melo to lead off the court. And while Lance Thomas has started off slowly, KOQ has stepped up and delivered when called upon to provide some quality minutes. Sasha is a true professional, brimming with confidence, and he’s helping the Euro kids acclimate to the NBA. In the long run, merely showing glimpses of what might be is not enough. The team must grow accustomed to winning, and it must fight for every 50/50 ball there is because this group will not do this alone, divided in ISO mode. Only by the strength of their togetherness can and will this eccentric group overcome the odds this season. The talent and temperament is in the room, now it must translate all of that on to the court in order for this year’s team to be successful in any capacity. Being competitive shouldn’t be the standard. Either way, the future looks bright. 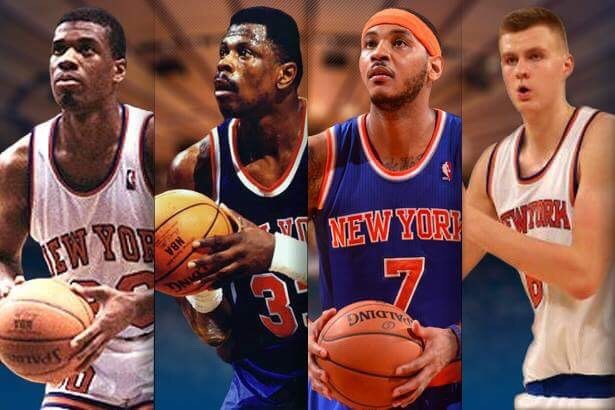 The PGs may or may not be here next year, but as long as KP is (and an aging Melo), and now with fresh faces like Holiday, Willy H., & Kuzminkskas, the decade of mediocrity might be relegated to the past. When in doubt, follow the unicorn.